As we approach a new year, a new Administration and a new session of Congress, the catastrophic risks to health care coverage include threats to repeal the Affordable Care Act – without an agreed-upon replacement, turning Medicaid into a block grant or per capita cap program, and further privatizing Medicare. Several recently-issued/updated reports underscore some of the significant dangers that would result from these actions. Last week, the Urban Institute released a report entitled Implications of Partial Repeal of the ACA through Reconciliation. The Report concludes that by 2019 partial repeal of the ACA would leave almost 30 million individuals without health insurance. The reconciliation bill that House Speaker Ryan and Senate Majority Leader McConnell hope to pass early in 2017 would leave 22.5 million people uninsured because people would no longer have to buy insurance (the so-called individual mandate), state Medicaid expansion would lose Federal funding, and certain tax credits would end. Another 7.3 million individuals would lose their health care coverage due to a likely crash in the individual health insurance marketplace as a result of the loss of millions of consumers. The Report also highlights how much in Medicaid dollars would be lost by states that have chosen to expand Medicaid under the ACA. Using Urban’s data, the Center for Budget and Policy Priorities produced charts highlighting how each of the 50 states would be affected by the ACA’s repeal. A recent Center on Budget and Policy Priorities (CPBB) report, Medicaid Block Grant Would Slash Federal Funding, Shift Costs to States, and Leave Millions More Uninsured, outlines the tremendous cuts to Medicaid under a block grant proposal, part of a recent House Republican budget. According to the report, a Medicaid block grant would likely eliminate the guarantee that everyone who is eligible and applies for Medicaid benefits would receive them, and likely would give states new authority to restrict eligibility, cut benefits, and make it harder for people to enroll. The Report notes that because block grants are designed to produce federal savings, states are given considerably less federal funding each year than they would receive under the current financing system. Generally, a state’s initial block grant amount would be based on its current or historical spending but then increases at a considerably slower rate than the currently projected annual growth in federal Medicaid spending. This results in increasingly steeper cuts every year, as illustrated in the CPBB graphic below. 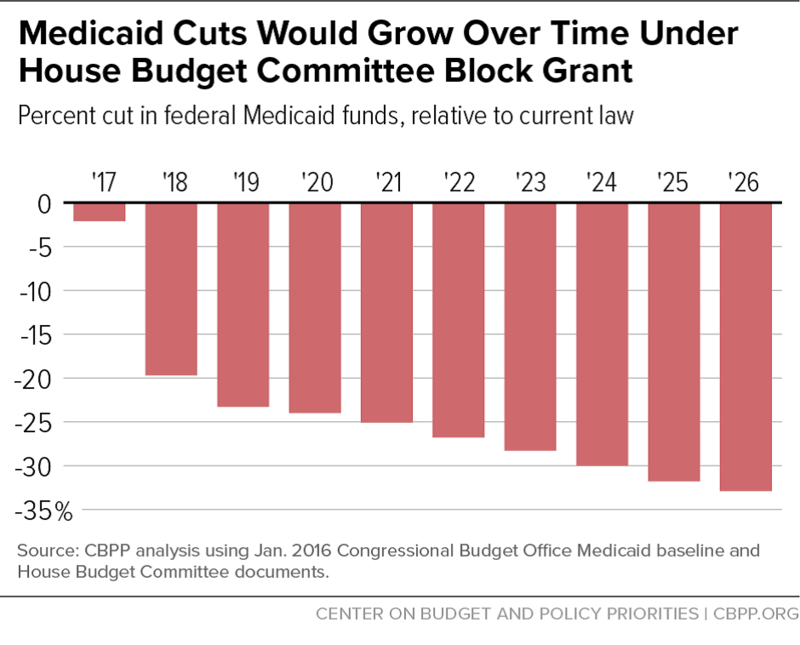 Thus, even modest initial cuts to Medicaid through a block grant would destroy the long-term viability of the program. Significant cuts to insurance coverage for low and moderate income people are on the horizon if the Affordable Care Act is repealed and Medicaid is changed to a block grant. In fact, a substantial percentage of American families will eventually be touched by these proposals. Hopefully the worst harm can be avoided if advocates and people who rely on ACA, Medicaid and Medicare stay informed and active.